When you have need shingle roof replacement or repairs done, it’s important to hire a reliable, qualified company to do the work. Look for a company that’s fully insured and ask about manufacturer certifications. These indicate professionalism and a commitment to their craft. 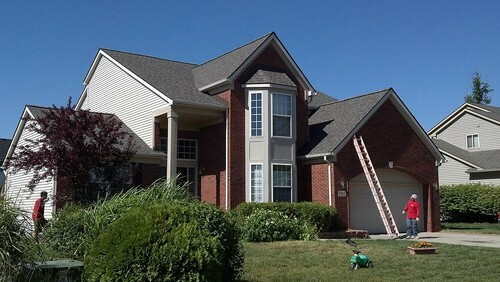 As leaves build up, gutters may become blocked. Water won’t be able to properly flow away from your roof and you could end up with damage to areas like the lower deckboard. Any accumulated leaves should be removed periodically. Otherwise, they trap moisture and can cause minor damage to your roof. Overhanging limbs can break off and cause substantial damage to your roof. Branches also let small animals such as squirrels have easy access to your roof, where they can cause damage. Check your roof for damage periodically, especially after a hail or wind storm. Use binoculars to look for shingles that are loose, curling, or missing. Also, inspect the flashing around chimneys and vents. Although you may be able to spot some obvious signs of damage yourself, a professional will know exactly what to look for. This can help catch small issues before they become a much more extensive – and expensive – problem that could require a shingle roof replacement.. If you a problem with ice building up on your roof, remove snow using a roof rake. Ice dams can prevent water from draining properly. It then backs up underneath your shingles, causing damage and possible leaks. Attic insulation not only helps save money on your power bills – it also helps your roof last longer. Without sufficient insulation, the air can become very hot, making your shingles decay more quickly. Look at your attic’s vents that lead to the outside. Make sure they’re not blocked and are large enough to adequately vent the space. Proper ventilation will help protect your roof from moisture damage. Have your roof professionally power washed regularly to prevent the growth of moss and mold.